Call 425-885-MATH or click below for a FREE Academic Assessment and Consultation! Take the first step towards providing your child with a solid math foundation. Give us a call to schedule your Risk-free assessment! Our meeting will give you and your child a sense of who we are, what we do, and how we can help. Call or complete the form on the top right to get started. In school, they treat kids the same because it is assumed that all kids learn the same way and at the same rate. The teachers are expected to cover vast amounts of material in a short period of time, not to mention the Texas STAAR test. If your child doesn't get a chance to master a skill for whatever reason – that's too bad. Teachers must move quickly to stay “on schedule". As a result, we see too many kids fall behind in math. What happens next? The class moves on! Here come multiplication facts, fractions, percentages, decimals, mixed numbers, exponents, ratios, x=?, divisibility rules, algebra, geometry, equations. It never slows down so your child can catch up! They feel overwhelmed, embarrassed, and all alone! They begin to expect and accept failure as the "new normal" and think "I'm just not good in math!" They lose all confidence in themselves and all of their other grades begin to suffer. Unfortunately, in most cases a private tutor is a temporary fix for a long term problem. Private tutors only help children "survive" tonight's homework, but they don't address underlying issues. In most cases, private tutoring is not going to be a meaningful long term solution. Your child deserves to have that long-term impact in their math education! Great Question! The very first thing we do is give your child a skills assessment. We give them both a written and oral assessment so that we can get a deep understanding of not only what they know, but how they think! We sit down with them, put them at ease, and give them an assessment that doesn't feel too easy or too hard. Most importantly, we find out HOW THEY LEARN! Then we build their trust by giving them a few ideas and strategies that they can use immediately. We then build a customized learning plan that targets skill gaps and quickly shows them success. In many cases “success” in math is something they have been craving! We get 100's of reviews that are glowing about how struggling students come alive after coming to Mathnasium. Their grade increase and their confience skyrockets! Take a moment to read what your neighbors have to say about us. Another great question! Our instructors are not just average math tutors. We have brilliant, engaging, inspiring math experts that work one on one with your child long enough to get them started and make sure they understand what to do. Then the instructor steps back and lets your child work independently to give them the time to process this new information without the pressure and stress of being watched. It also prevents a "learned helplessness" where the student feels that they need the instructor sitting in front of them all the time in order to be successful. Our instructors quickly come back after a minute or two in order to make sure they are doing the problems correctly, give them encouragement, and praise them for their efforts! If the student needs more help we simply teach the lesson again in a different way without judgment or ridicule until they "get it." This enables your child to become a "confident, independent learner." Call Now (425) 885-MATH (6284) and Let's Get Started! You are transforming Carter’s passion and confidence for Math!!! My child has really connected with some of the instructors at Mathnasium and is glad to be someplace that works with higher math students as well as "Kiddie Math" kids. Great place for extra math help for kids of all ages. Friendly staff that takes pride in caring for our kids. Love how welcoming the instructors are everytime we come in. The owners too:) My daughter loves math now. Thanks to them! Our son loves the atmosphere and how the instructors make it comfortable to ask for help. He has always come out smiling and his school grades are showing a positive trend. We are glad we found this place! My son felt very comfortable there even on his first day and has come away from every session feeling great about what he learned and accomplished. Only been a month, but our experience has been great so far. Visible improvement in our daughter's confidence and grades. Kudos! Mathnasium has kept our son's confidence and love of math high. It has been a great support with his math homework. Thank you! Its only been a month but my daughter seems to like it. It’s convenient, organized and very nice and helpful tutors. My daughter has had a great experience. Mathnasium has gotten our 3rd grader to be interested in doing better in math! He doesn't dread coming in and he's motivated to earn incentives. Gracie’s Math grade has gone from a D+, to an A! Her math confidence is soaring. Thank you! Melody has maintained an A in her class, and she is still happy to attend Mathnasium sessions to continue her learning process. Ben loves going (he looks forward to it!) and we've seen a big change not only in his ability to do math, but in his perseverance when it gets tough. And this is after only a month and a half! My daughter really likes the people teaching there. She feels very comfortable in this place. We have already referred several friends. I'm amazed at the organization with the learning process and how you track kids. We've seen a big improvement in confidence and test scores. If you could open earlier Wednesday since the kids get out of school early that would be very helpful. Mathunasium is great as provides personalized attention for each kid as per their level. kid can learn at their pace, doesn't stresses them but same time keeps them focused on areas needed. My child's math has improved a lot under the tutelage of Redmond Mathnasium. I really like the systematic approach here. The 1 point deduction is for the limited opening hours-- it will be so great if the center is open for Friday and longer hours on Saturday too! My child has been only able to get about 1 session per week, that breaks down to about $70 per session. Pricey! Longer opening hours will help spreading the crowd and shortening the occasional waiting line. Thank you for your feedback. It has been a pleasure working with your child and she has made astounding amount of progress. Our enrollments are drop-in, which means your child can come any time during the center hours. We recently added additional center hours to Saturdays to enable more students to attend. I hope this enables you to bring in your child more often. We strive to make quality education as affordable as possible. Your child's session is coming out to be pricey, because she is enrolled in our unlimited sessions plan, but she is only coming in for one session a week. I have sent you an email with details of the other enrollment options better suited for students that come only once a week, making the sessions affordable. Thank you once again for your feedback and I hope to continue partnering with you in your child's academic growth. Thanks to you, we do not have any math concern. I would have loved a few more hours of drop in availability in the summer. Perhaps a few morning hours of operation. My Kid likes going there daily and have improved in Maths. Incredible!! Kiran has been so so helpful with getting my Daughter on track with her math. She is through, knowledgable and very very helpful. The program is set up to help the students succeed from the start with a detailed progress reports to make sure that the student is where they should be with their plan. I am soooo very grateful to Mathnazium. My Daughters Math confidence improves weekly, she is sure to see improvement in her math scores on the ACT!!! Thank you very much for being so very professional service and incredibly helpful!!! Awesome Center and I really see the difference in teaching and educating. My kids love Mathnasium; there are never any complaints about going or anything about the program. My daughter says the worksheets are amazing. The incentive program really seems to work! I like it, more to my expectations. Our kids have benefitted greatly by the talented instructors at Mathnasium. Mathnasium has been very helpful for homework support and test preparation from Algebra through Calculus. My daughter been going for 5 months and her confidence in math has increased tremendously. She enjoys going for math tutoring. These facts rises to the top of the list for why we are continuing to go. Program is designed with utmost care and appropriate for the kids learning needs. We love this place and will sign up again this fall. We saw a direct impact of our kids math grades in school. Mathnasium style of teaching is good and interactive. My son is much more interested maths now as he gets all the attention and help he needs. My son was able to quickly catch up on missing schoolwork and is building confidence. The individual instruction helps so much. Thank you for your dedication to the kids!! Very organized and great management! The new facility is wonderful , maintaining a great learning environment that gives more room and space for the students to learn and excel in mathematics. Mathnasium has been great for both my kids. My younger child is ahead of school in math, and she gets problems that are based on her level. My older child gets great support for more advanced math when he is struggling. The options for help are great, and the flexible schedule is helpful with the ever changing “kid activity calendar”. We have had a great year with Mathnasium. Our daughter wants to go to her sessions, even on weekends. We highly recommend it. The system also allows us to "get out of the way" and let her develop her own learning and accountability skills. Since my daughter started going to Mathnasium, we have never had to worry about her grades or performance in Math at school. Her confidence and our piece of mind is due to Mathnasium. Thank you very much!! Tushar really enjoyed coming over to study. It didn't feel like a chore to him to finish homework. My son really enjoyes the environment. Also having a prize wheel really motivates him to do more. He enjoys Joey as his teacher. All teachers are great. Hands down this is the best math educational facility out there! As a parent, I love Mathnasium due to the individualized attention that my sons receive. The guidance by the dedicated instructors is great, and it has alleviated the tension that I had with my boys to work on math workbooks at home. I ditched the workbooks, and I have left Mathnasium guide my sons' learning. Both of my boys are excelling in Math, and I am happy to not to have any battles over math work at home. My sons also enjoy the incentives for working hard. The Center Director is fantastic...very attentive. My money is well spent at Mathnasium! My daughter has been going regularly for 1.5 months. There was an immediate attitude change around math after the first couple of sessions. She was having a fun experience which was something I never expected. She has continued to enjoy going and we have seen an improvement in her confidence and attitude in math. She is still working on building strong foundations and not up to where she is in school yet, so it hasn't had a dramatic affect yet on her grade, but at some point she will catch up and surpass her class work and that is when we expect to see a dramatic improvement. For now the fact that she is enjoying the Mathnasium experience and math itself is so refreshing and good for her self confidence and self esteem. Great Experience. Friendly, patient staff. Thank you. Personalized learning program at Mathnasium is working good for our kids. They have been doing better in their school tests. Instructors are taking care in making sure that the kids are covering all the topics. We appreciate the effort management is taking in keeping us informed of the kids progress. My child enjoys going to Mathnasium. She never complains that she has to go. To me is a very good sign. She has only been going for a month and a half but she is learning and understanding new subjects that are introduced to her. My son has really enjoyed his first month at Mathnasium and always has something nice to say about the teachers! The biggest challenge is the downtown Redmond traffic. Even worse with recent traffics revision city implemented. Mathnasium is helpful to build child's confidence in certain math areas they are struggling to understand. You have some good instructors and my child benefitted well. Thank you. my daughter loves the program. The way mathematics learning is promoted via rewards system and dedication of the team is great. Kids are looking forward to the classes always. Since joining Mathnasium, our daughter has improved in her classroom work and daily skills. She loves going to the center. The instructors, incentives and friendly accepting environment has helped to improve her confidence, overall. Thank you Mathnasium instructors for your efforts! Very happy with our experience, flexible scheduling is great and the tutors are all so knowledgeable and helpful with my daughter. Our kid really enjoys the Math interactive lessons at the center and his math aptitude has grown up as well. My daughter loves going to the center and doing math! The instructors are very kind and have been great working with my daughter. She always looks forward to going and that says a lot in itself! Our daughter received an "A" in math for the first time in her life last semester! I have already referred many family's ! Thanks for helping educate my son Jake Berreth. Catalina's experience with Mathnasium has been positive. She looks forward to going, her confidence is building and is reflected in her school work. She like the incentives and feels independent in the process! Great individual approach to every student. Has been really helping with his skills and boost his confidence and comfort level. I am very grateful with Kiran's support with my daughter Elena. She carefully listened Elena math necessities and created a plan to support her math learning. Thank you, thank you! One recommendation I have is to avoid switching teachers during the students math lessons, the student has 50 min and is very distracting for the kids to change teachers and start again. I like the flexibility and variety of topics provided for the children. Because of which, Children do not get bored. Also, the incentives keep them motivated !! My daughter enjoys coming to Mathnesium and I think it really helped her attitude towards math. Mathnasium has built a highly adapted and contextual learning curriculum supported by highly trained faculty. Being a seamless experience between Singapore, Malaysia and now USA was another factor in favor of Mathnasium. With a great start, we are looking forward to yet another rewarding experience for our children from Mathnasium in Redmond. Deepak Setty. My kids really like the new star-reward system. It has become such a great motivation for them to work harder and to want to go to Mathnasium all the time. They are disappointed on Fridays(they can't remember even though I tell them each week)that Mathnasium is closed. Thank you. The owner Karim is very responsive and personal. She always takes enough time with every parent and student to meet their individual needs. The center is also very adaptive to overcome challenges. For example, to ease the students' wait time for sitting down with a tutor, Katim sent out an email to encourage parents to bring students outside of peak hours if possible. Tables and seats were rearranged to accommodate more seats for students. My two boys like being there working with their peers, with encouraging and 'math-smart' tutors! Flexibility in time and the spirit of help, not only in math but Physics and chemistry too! I like the teaching methodology and the attention given to each student. More importantly the lessons are tailored to each student's capability. My son really looks forward to going to Mathnasium three times a week. His grade in math has been very consistent since he started. He loves all the instructors at the Redmond location. My daughter started Mathnasium just over a month ago. She looks forward to going to the center almost everyday the center is open. Honestly, I wasn't expecting her to be a regular attendee. Her perception of Math was that it's boring, she doesn't understand Math, etc. My original intention was to change that perception. I am grateful that the tutors pay genuine interest to teach math in an understandable way for each kid. She loves to study with any of them. My daughter loves all the teachers, she improved grades right after she started. Ben loves to work with the teachers at Mathnasium. His confidence has improved and he is more excited about math. In elementary school, my daughter wasn't challenged in math, even though she was working three grade levels ahead. By attending Mathnasium, the tutors made sure that she had no gaps in her knowledge, and kept the work novel and interesting, as she continued to progress through the high school mathematics curriculum, while in middle school. It doesn't matter whether a child is behind or ahead of the general curriculum, because Mathnasium can meet them where they are, with tutoring targeted to their specific needs. 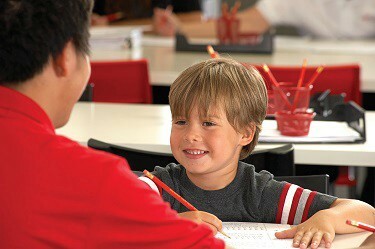 Instructors are friendly and knowledgeable; and provide math skills in a fun learning way. I appreciate the fact that my child can get assistance with her homework that I can't always help with. One thing I have noticed recently is that (my social & quite talkative) child might be indulging in perhaps a little too much socializing time. Usually, the instructors are good at balancing work & social time. Overall, I continue to be satisfied with the math skills my daughter is building at mathnasium. After joining Mathnasium Redmond, the amount of progress that I have noticed in my daughter has led me to greatly appreciate the absolutely positive and supportive learning opportunities that Mathnasium provides. We have had great success with your tutors. My daughter was able to pass her algebra II math class with your staff and their dedication. My daighter Naphtali had been so confident about geometric solving problems, I can see how happy she feels now, definetly I am so proud with all the math team for the patience and knowledge they have in order to help our kids , thanks so much. Sincerely, Josefina Orozpe.